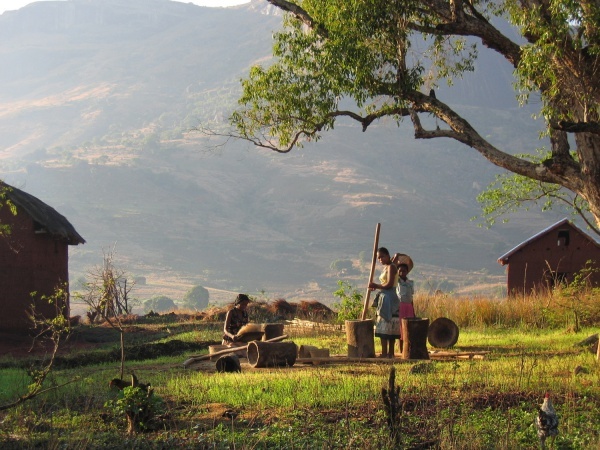 Tsaranoro circumscribes the Tsaranoro Massif and Tsaranoro Valley, located on the outskirts of Andringitra National Park in southern Madagascar. The spectacular rock walls of the massif and the mindblowingly beautiful valley offer numerous climbing routes and hiking trails. The more adventurous can participate in paragliding or even base jumping. 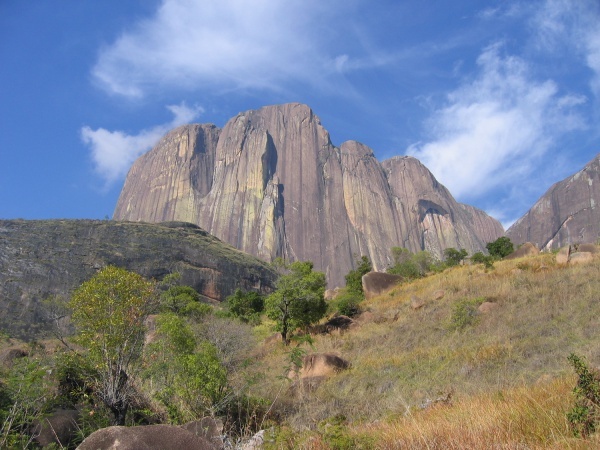 The rough granite walls of the Tsaranoro Massif reach up to 800 metres. Climbers from all over the world come to Tsaranoro to practise free climbing. Although the vertical cliffs were discovered by Di Taylor and Tony Howard already in 1981, it was not until 1995 that the first route, Rain Boto, was climbed by Kurt Albert and Berndt Arnold. The massif is divided into Karambony (500m) and Tsaranoro Be (800m). The Tsaranoro Valley is a walkers paradise, an ideal location for individual day treks or guided multi-day expeditions with overnight camping. The treks lead through open savanna and tropical humid or dry forest. Tsaranoro is the primary habitat for Ring-tailed lemurs. Various species of falcon, snakes, lizards, chameleons and plenty of orchids can be found. The best period for climbing and visiting the valley is from March to December. 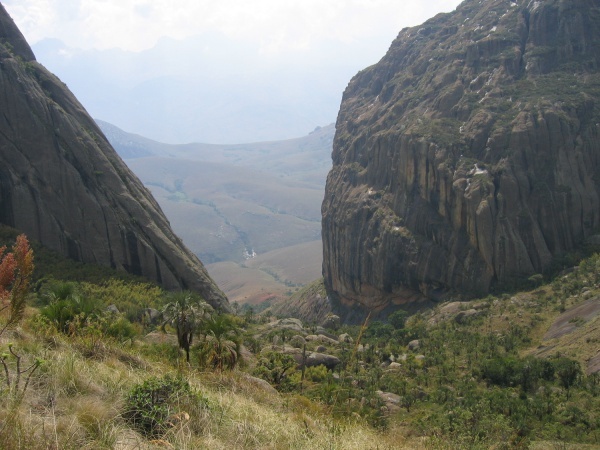 The Tsaranoro Massif and Andringitra Massif form the natural border between the territories of the Bara and Betsileo people. It is believed that the name Tsaranoro originates at around 1820, a time when the Betsileo were fighting the Merina who tried to overthrow their neighbouring kingdoms. Therefore, the Betsileo King Sahanambo was hiding with his closest followers in a cave in the nearby highlands. The cave entrance was barricaded for several months, until food ran short and new provisions had to be obtained in the valley. The king ordered his two sisters, Ratsara and Ranoro, to walk down the valley to fetch food. After the sisters left, the cave entrance was carefully closed again. As Ratsara and Ranoro faced no problems in organising new provisions they returned earlier than expected and found the cave still closed. Even by making loud noises, shouting and knocking, nobody opened. Although, the sisters had enough to eat they were missing fresh water and therefore became weaker and weaker as the days went by until they finally died of thirst. When King Sahanombo ordered the cave to be opened, he found his two sisters dead at the entrance. In their honour he named the highest rock Tsaranoro. The three rocks on the left were named Vatovoarindrina - meaning "closed stone gates". Since those days it is fady (prohibited) to talk of the Merina people or even speak with a Merina accent within the sacred forest at the foot of the mountain. It is believed, the person breaking the fady will walk in circles and eventually get lost. This page was last modified on 21 June 2017, at 21:15.